Cytoplasmic inclusions in a male F344/N rat from a subchronic study. Cytoplasmic inclusions (Figure 2, arrows) in a male F344/N rat from a subchronic study. Eosinophilic or cytoplasmic inclusions or material ( Figure 2 , arrows) can be found in control as well as treated rodents. These hyalinized inclusions are also seen in hepatocellular neoplasms. The examples in Figure 1 and Figure 2 represent a postmortem, time-dependent artifact especially common in male rats that are not completely exsanguinated at necropsy. The cytoplasmic vacuoles contain plasma that has entered the hepatocyte cytoplasm (plasma influx) of affected hepatocytes (Li et al. 2003). Similar but more discrete eosinophilic hyalinized inclusions, which may represent protein present in lysosomes, can be seen in control and treated rodents and are also seen in hepatocellular neoplasms. 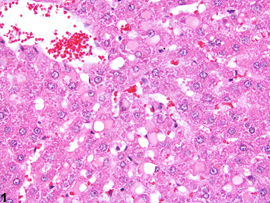 Hyaline intracytoplasmic inclusions are relatively uncommon and thus should be documented and given a severity grade that is based on the frequency of affected hepatocytes. If there is reason to believe that they are a time-dependent artifact associated with incomplete exsanguination at necropsy, this should be discussed in the pathology narrative. 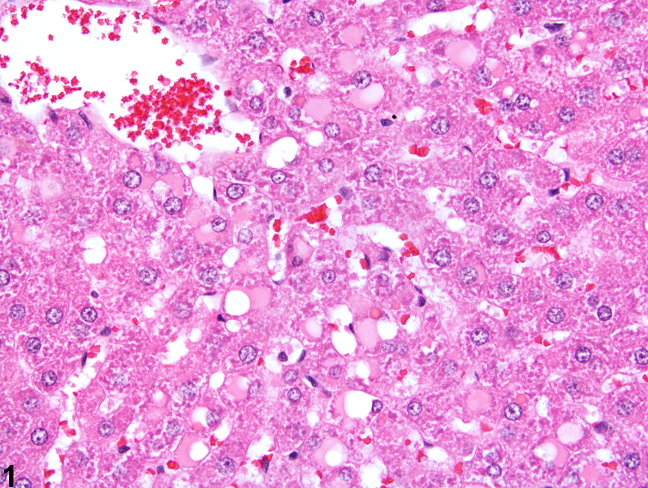 Cytoplasmic inclusions need not be documented when present in neoplastic hepatocytes. Li X, Elwell MR, Ryan AM, Ochoa R. 2003. 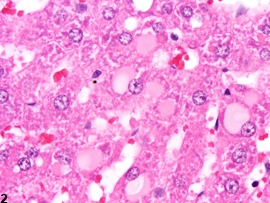 Morphogenesis of postmortem hepatocyte vacuolation and liver weight increases in Sprague-Dawley rats. Toxicol Pathol 31:682-688.